Prospective members and visitors are welcome to join our rehearsals at any time. Rehearsals take place on Thursday nights at 7:30 pm at the Loyola University Communications & Music Complex, 2nd floor, room 230. The Music building is located at the corner of St. Charles Avenue and Calhoun Street, New Orleans, LA; steps from the Saint Charles Streetcar. Shades of Praise appears (briefly) in a T-Mobile National Commercial that Premiered During the Oscar Broadcast: Keep your eyes peeled for the people in choir robes: that’s us! We are happy to be included in this snapshot of the joie de vivre of New Orleans. Shades of Praise Sings Happy Birthday to the National Park Service! The National Park Service turned (or “made” in New Orleans speak) 100 on August 25, 2016. Shades of Praise joined the Centennial Band of our very own, New Orleans Jazz National Historical Park to sing Happy Birthday to the NPS. 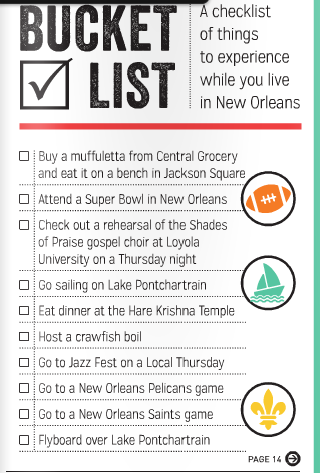 In September 2014, Gambit Magazine’s 21 Guide added “Check out a rehearsal of the Shades of Praise gospel choir at Loyola University on Thursday night” as item 3 on their Bucket List, a checklist of things to experience while you live in New Orleans!